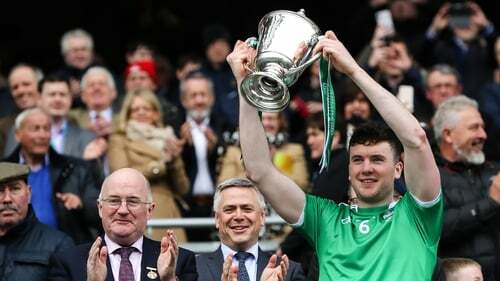 Limerick captain Declan Hannon says it's possible that they might not be among the top three hurling sides in Ireland despite winning the Division 1 title. After ending a 45-year wait to lift the Liam MacCarthy Cup last year, the Shannonsiders added a League title to the trophy cabinet, a first National League success since 1997. John Kiely's side have continued their winning form since that famous result against Galway in 2018, and their eight-point win over Waterford capped off an impressive league campaign. Kilkenny legend Jackie Tyrrell said earlier this year that he believes Limerick won't retain their crown in 2019, a comment which Hannon admits "could have" caused offence to him in previous years. However, he also insists that despite their success in the league, Limerick's status as hurling's top dogs is far from cemented at this stage of the season. "He could be right, we mightn’t be in the top three in Ireland, it’s very very competitive," he said at the 2019 Kellogg's GAA Cúl Camps Campaign Launch in Croke Park. "Look, it just comes back to ourselves and our own performances on the pitch, and that’s all we can really focus on. We can’t focus on anything that other teams are doing, so we’ll see where we are at the end of the year." On the topic of people not seeing Limerick as major All-Ireland contenders, Hannon added that "people were probably right in [saying] that we were bottom of the barrel" prior to their All-Ireland victory. Hannon alongside Donegal's Michael Murphy at the Cul Camps launch. "We don't look too much into that and what's coming in from the outside or any of those influences. If people don't want to take us seriously that's fine, we take ourselves quite seriously and we train very hard. If we're looking outside, we'll fall back and won't be competitive at all. "Momentum is a massive thing in the GAA and hurling in particular"
"We do the best we can inside the camp and move on. "I suppose we continued our form from 2018 onto 2019. We put a big focus on the league and didn't want to just come into the league and win a game here and there and lose the rest. We didn't want that to happen because momentum is a massive thing in the GAA and hurling in particular. "We wanted to be going into the championship with as many competitive games as possible and we got that over the league. "But the league is the league and the championship with be a different kettle of fish." The Limerick backroom team has been bolstered by the recent addition of former Galway hurler Tony Óg Regan, who has come in as the team's new Performance Psychology Coach. He takes over from Sligo native Caroline Currid, whose contribution to the Limerick team was widely praised last year. Hannon admits he wasn't always eager to embrace the benefits of sports psychology, but has become more accustomed to it over time. "I suppose I wasn’t really before, maybe a bit more now. Different things in preparation, everything like that, there’s massive benefits to having a sport performance coach. They’re excellent at what they do, and it’s the small things, they pick up on everything. Previously I might have said ‘ah I’ll be grand’, but you might always be grand. "Everybody has met Tony on a one-to-one basis and as a group setting. He’s been very good, a seamless transition from Caroline Currid last year to Tony this year. Lads have bought into and they’re very happy with Tony." The Limerick players have dispersed back to their clubs for April before reconvening next month to prepare for what is expected to be another exhilarating Munster championship campaign. Tipperary and Waterford unexpectedly failed to progress out of the province last year, and Hannon emphasises how difficult it is to predict how this year's competition will unfold as they prepare to face Cork in their opening round-robin clash. "The Munster Championship is massive and it's very competitive. We're looking forward to it. You could call out three teams there and they might go through or you could put in two different names. It's all on the day in these games. If you can get a run in the first round, it sets you up. You lose in the first round and you're under savage pressure. "Getting into the top three is the priority in Munster. If you get to the Munster final, that's a bonus." Declan Hannon, Sarah Dervan, Sean Wade, Sinead Ahearn, and Michael Murphy launched the 2019 Kellogg's Cul Camps campaign at Croke Park today.